Hamlet Au ran a reference to a New York Times piece about virtual meetings. We've been talking a little about the concept in my current class, as we read Exodus to the Virtual World, by Edward Castronova. Other than making me sing "The Time Warp" from The Rocky Horror Picture Show, I saw little use in the graphic that accompanied a story about a groundbreaking (to the Times staff, anyhow) development. We are a long way from selling that particular technology to any serious business. There's also a drop-dead hilarious video of a "business meeting" with this clumsy technology. I'm no graphics maven but I could not get through the demo without breaking down in gales of laughter. The avatars make Second Life's look wonderful. Granted, as I noted over at New World Notes, using an avatar seems to spur more participation in a meeting than I have seen in teleconferences or Elluminate meetings. This merits formal study by academic psychologists: I have no idea why the avatar is more empowering than a teleconferencing window. That said, I do prefer those technologies or Skype for small-group conferences, but they fail to enable really good work for large groups. In some cases, one may as well watch a television seminar with one or two active participants. 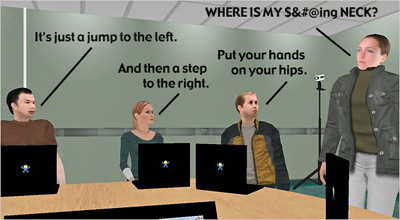 Second Life does pretty well for large-group meetings, but it suffers in professional circles from its rep for cybersex and nonhuman avatars. My colleagues not in virtual worlds, like many business folks and even many of my Millennial students, are wary--very wary--of identity shifting online. For that crowd--and it's one I suspect to be the majority of potential conference users--to make the Castronova "exodus" they'll need something like the virtual meetings shown in the Times story.